Basalt. 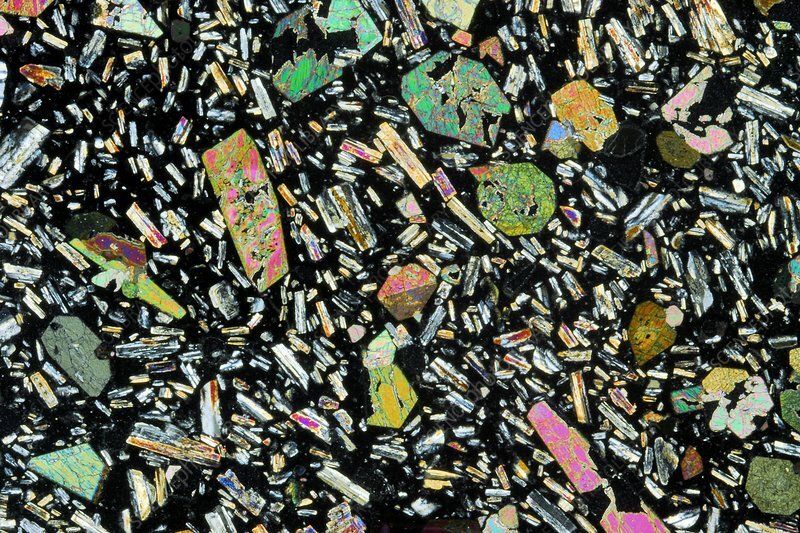 Close-up of a thin section of basalt (black). Basalt is a common and widespread dark-coloured igneous rock. It forms as a result of the cooling of lava flows or small intrusions and is typically black. In this image, large coloured crystals (phenocrysts) appear embedded in the fine-grained basalt matrix. The size of a phenocryst depends on the rate at which it was cooled out of the magma as the basalt formed - the larger the crystals the slower the process. Magnification x5 when printed at 10 centimetres wide.